Few people might realise that the world's longest running civil war is taking place on the edges of Myanmar and Thailand. This 70 year conflict between the Myanmar military and the countries' ethnic minorities has left hundreds of thousands displaced, an entire generation growing up in Thai refugee camps. Mae Sot is one of three official land border crossing points between Thailand and Myanmar and has economically been dependent on a thriving community of NGOs and aid workers. Their mandates are directed at the largely ethnic Karen Burmese refugees living in the camps dotted along the Myanmar border. A biography of Aung San, father of Aung San Su Kyi, was known as the founder of the Burmese Military, and is considered the father of modern-day Myanmar and the founder of the Communist Party of Burma. His daughter, Aung San Suu Kyi, is the current leader of Myanmar. Between 1962 and 2011 Myanmar (formerly Burma), had been one of the world’s longest running military dictatorships. In 2012, democratic elections were held, bringing longtime democracy advocate Aung San Suu Kyi to power. Western countries began lifting economic sanctions, increasing development aid and writing off billions of dollars of Burma’s foreign debt. The Karen National Union (KNU) signed a tentative ceasefire and the Panglong 21 Peace Process sought to end 70 years of insurgency in the country’s borderlands. We spoke off the record with UNHCR Thailand's Repatriation Officer and Senior Field Coordinator regarding the current repatriation policies and procedures and the difficulties being faced by all sides. The more people we spoke with the more we realized how this ties into a bigger issue: nobody knows what’s going on, and it’s stressing everyone out. With diminishing food rations and many aid organizations relocating from the Thai camps into Myanmar, some feel that the Thai government, which does not allow naturalization or any pathways to assimilation, wishes to nudge them out by making conditions unlivable. Over in Myanmar, investment can and likely will make positive changes over time, and while those who are ethnically Burmese might be benefiting from the new government and economic stimulus, the situation is much more complicated for ethnic minorities. Myanmar has a history of government (and thus military) involvement in development projects, many of which are focused on the resource-rich, semi-autonomous states that many refugees have fled from. Physicians for Human Rights found that human rights violations in Karen areas were up to ten times more prevalent in areas with development projects as compared to other areas (Davis et al., 2012). Karen Human Rights Group’s (KHRG) recent report also indicates that natural resource extraction and business projects fuel human rights violations in the Karen State (KHRG, 2013a). Similar findings around development projects have been found in other parts of the country (see e.g. Human Rights Watch, 2012c). Access to the refugee camps in Thailand has been restricted purely to aid organisations, most of which also are not allowed to stay overnight. Somewhere Films spent three weeks in Mae Sot, doing research, conducting interviews and making connections. Mae Sot has the air of a dying town as NGOs are shuttering their doors and moving house to Myanmar. But though NGOs might be leaving, more Burmese seem to be arriving. Due to the relaxing border policies and the newly available day passes that we had also utilized, they come into Thailand to buy local goods which they then take back and sell in Myanmar. We also got to know the local migrant art community, with whom we spent much of our time behind the camera. Patrick Sone Lin Htoo is a Burmese filmmaker we met during a weekend of fundraising for the Mae Tao Clinic, in Mae Sot, Thailand, which like many NGOs in the area, has seen its funding rapidly diminish over the past year. Patrick has been shooting different film series based around the lives and experiences of refugees in the camps around area. 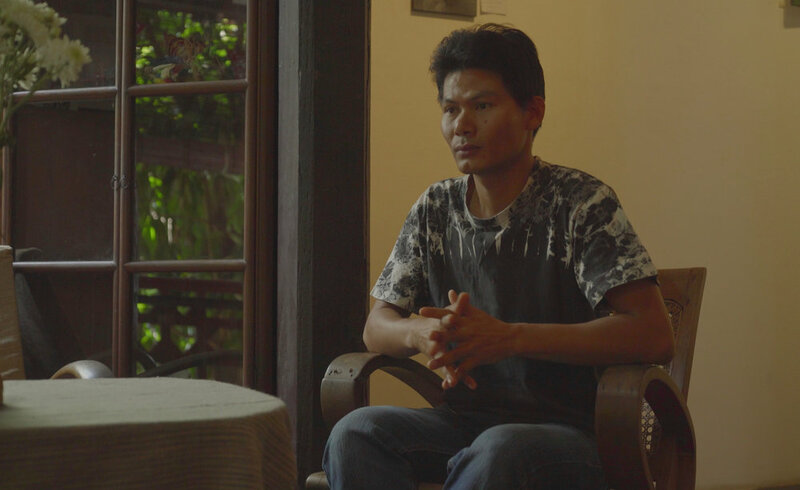 The bigger project he has in the works is a feature length documentary on a once child political prisoner of Myanmar who was arrested some 15 years ago for handing out pamphlets that challenged the military government. Maung Maung, a refugee from Karen State in Myanmar, has been living in Mae Sot since 1995. Maung Maung has been been able to use his art as a means of seeing the rest of the world, but still deeply desires to return to his village one day. So far, the situation hasn't been safe enough for him to do so. Wuna Zaw is a Burmese migrant from Yangon, who has been living in Mae Sot since 2002. He splits his time between making his own art in Mae Sot and teaching at many different migrant and monastery schools across the border Myawaddy, Myanmar. He strongly believes that academic as well as artistic education will be the saving grace of Myanmar's future. Thai military at 'Friendship Bridge', the only open land border crossing between Thailand and Myanmar. Burmese children wearing Thanaka at a Buddhist monastery school in Myawaddy. The monastery schools are set up for children who are unable to afford the school uniforms or supplies necessary for the state run schools. For better or worse, Mae Sot reflects the seismic shifts taking place in the countries that surround it, and the uncertain future that looms ahead. This online resource has been invaluable to our research on this issue, and if this topic interests you there is no better place to do a proper deep dive. We had the chance to meet with and do some work for Burma Link's enigmatic and low profile founder, who coordinates most of the website's content on her own. You can donate to Burma Link through Paypal at the bottom of their website. Local news on all things Karen related, reported from the ground. In addition to being a gallery space and retail outlet for goods made by the Karen Women Organization, Borderline also has an excellent cafe. Many of our days were spent eating the amazing and sustainably made Burmese food here while working on our laptops. A combined dissertation of Social Psychology and Cultural Encounter by Christa Kløve Kranich submitted January, 2017.